Reputation is a very valuable asset - and almost impossible to rebuild once it's gone. Reputation plays an important signalling role in an imperfect information world and companies endeavour to preserve it. In this study, I evaluate empirically the role of reputation for companies that engage in Twitter. The results confirm that getting negative tweets, many expressing grievances, strongly correlates with low firm performance, suggesting the importance of social media (SM) in times when information spreads fast and easily. Reputation is a very valuable asset, almost impossible to rebuild after having lost it (Tirole, 1996). This has a higher impact in industries whose customers cannot observe a product’s quality before purchase, in which case the past quality becomes an indicator of present or future quality (Shapiro, 1983). Furthermore, once customers identify a non-compliant product, the negative effects can extend to other products from the affected brand and even to products of unaffected brands (Toledo and Villas-Boas, 2016). To monitor reputation, companies can follow customer experience closely. Recent research from MIT Sloan and Google shows that companies that keep track of customers and develop customer experience beyond the sales funnel are those that grow their business. Preserving reputation changed with the arrival of the digital world. Before the widespread use of social media, companies obtained information about complaints with some delay. Thanks to SM, they now have access to a broader audience’s view at a higher speed. However, companies that engage in SM increase their reputation’s exposure. Employees, clients, suppliers, etc., can provide real-time feedback, which potentially may influence a firm’s reputation. This study investigates whether a Twitter account helps companies track their reputation more closely. The empirical analysis is based on Twitter data collected from respondents to the World Management Survey that possess a Twitter account. The survey contains firms in different sectors and I focus on those present in the UK and the US. I manually identified these Twitter accounts (or handles) excluding, for instance, those dedicated to job recruitment. I used the handles to randomly collect public tweets sent to the firm, by making queries to the Twitter Application Programming Interface (API). In this exercise, I use around 4 million tweets collected from January 2016 to May 2017. In January 2016, only around 400 firms out of 3,000 had a Twitter account. Interestingly, my evidence suggests that there is an association between having a Twitter account and being productive – controlling for industry. Given the high dimensionality and noisy character of tweets, classification and modelling are natural challenges. To overcome these issues, I work with the Supervised Latent Dirichlet Allocation (sLDA) (Blei and McAuliffe, 2007) and concisely represent semantic themes for the collection of tweets. Firstly, to obtain the response variables, I build a vocabulary based on the Cambridge Thesaurus and Guiso et al. (2015). I classify tweets, identifying seven aspects that can reflect the audience’s view on companies’ performance: environment, innovation, grievances, corporate values, corporate people, growth and others. Then, each tweet is paired with a response. Secondly, I jointly model the remaining words in tweets and the responses, computing sLDA estimates or latent topics for each company. I assess the quality of the estimation using fivefold cross-validation and measuring predictive R^2. Given that the words in the vocabulary may not gauge properly the sense of what the public tells in Twitter, I complement this exercise by performing sentiment analysis (Feuerriegel and Proellochs, 2017). This allows me to label each word within a tweet as positive, negative or neutral. Hence, a tweet is considered negative if the proportion of negative words is higher than the positive and neutral ones. Based on this classification, I compute a negativity variable (ranges from 0 to 1), which is the average negativity present in tweets sent to the firm. 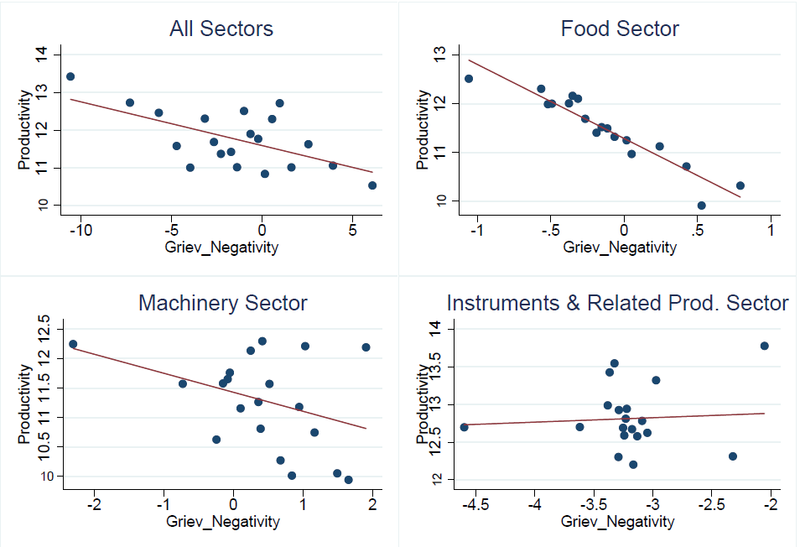 Finally I combine the estimates from both sLDA and sentiment analysis, and delve into the link between grievances and negativity with firms’ productivity at the end of the studied period. Productivity is based on the return on capital employed (from Orbis Bureau Van Dijk). I run regressions, which include the sLDA firm estimates for grievances, the average firm negativity, the interaction between both, and some additional controls, such as the size and home country of the firm, whether it’s a multinational and the industry to which it belongs. From the seven sLDA latent topics, grievances are probably the most direct channel towards reputation. Furthermore, negativity around unresolved or badly managed grievances affects reputation, potentially hampering firms’ productivity. Hence, I focus on the heterogeneous effect of grievances alongside negativity. The interpretation is that grievances that are not sorted and generate negative comments on Twitter may have a detrimental effect on firm performance. Conversely, the impact is abated if grievances are sorted out quickly. Figure 1 is drawn using this analysis. The plots in Figure 1 use different samples of firms. The first panel shows the results for firms in all sectors and the other three panels look at specific sectors. The evidence suggests that there is an additional underlying heterogeneity: firms operating in different industries may be affected differently by grievances and negativity. The food sector emerges as the one that more urgently needs to handle grievances swiftly and effectively, to avoid losses. The machinery sector exhibits some negative patterns, while for the instruments and related products sector there seems to be almost no relationship. The caveat from these results is that the firms that receive grievance reports and negative comments are less productive per se. Further research is needed, to make a causal claim that people’s view in SM can affect firms’ productivity.